Bronze, 79.875 x100 in, 2006. Bronze, 17.375 x17.375 x9 in, 2006. Bronze, 67 x23.5 x 60 in, 2006. Bronze, 29.125 x27.125 in, 2006. Mixed media on Panel, 43.25 x43.25 in. Mixed Media on Panel, 24 x 24 in, 2001. 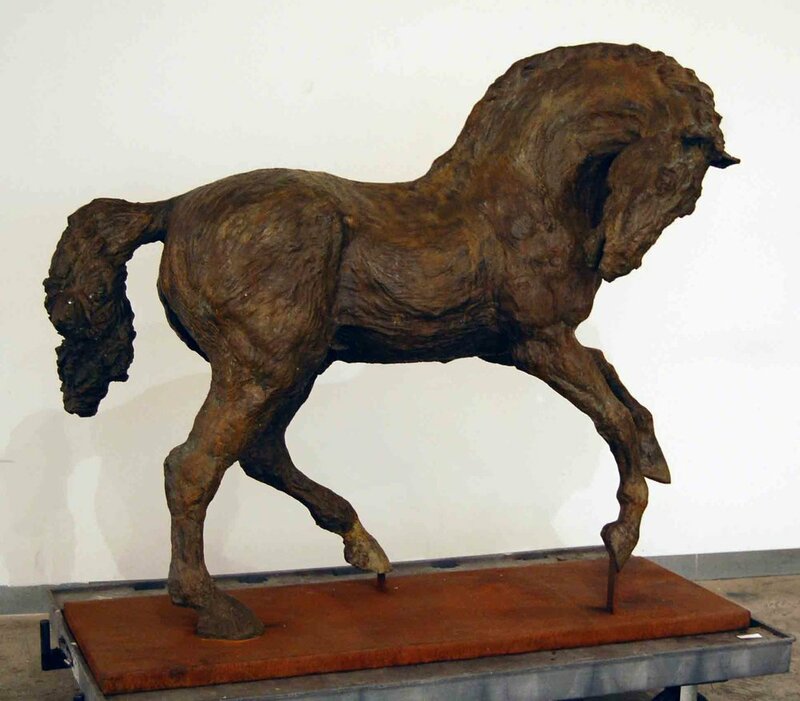 Lina Binkele's large-sized sculptures of spirited horses and maidens of angelic faces, exquisitely rendered in bronze and delicate sketches , drawings and oil paintings, are timeless and full of meaning and aesthetic value. Curved, sweeping lines and precise strokes, reminiscent of Leonardo da Vinci, give shape to remarkable equine or feminine figures. In the classic tradition, her horse sculptures capture the wonder of the animal's anatomy and the marvelous balance between strength and speed that made it the carrier of civilization for years. The visual effect of the finished piece is powerful, emotional and dramatic. Born in Bogota, Columbia, where she still resides and works, Lina started to take carving lessons soon after graduating as an anthropologist, with training in archaeology. Her degree in museology perfected the foundation for her career as an artist and her chosen subject matter: horses and women. Numerous One Woman and Group Shows in Bogota, Miami, Palm Beach, New York and the Philharmonic Center for the Arts in Naples have gained her international recognition. Corporate and private collectors include clients in South America, the U.S., and Europe.